A home is engulfed in flames during the Woolsey Fire in Malibu. Wildfires burned out of control on Friday across California, killing at least nine people in a mountain town and forcing residents to flee the upscale beach community of Malibu in the face of a monster fire storm. "This event was the worst-case scenario. It was the event we have feared for a long time," Butte County Sheriff Kory Honea said at a Friday evening press conference. "Regrettably, not everybody made it out." "Fire is now burning out of control and heading into populated areas of Malibu," the city said in a statement online. "All residents must evacuate immediately." Some 95,000 residents have been evacuated in Ventura County alone, the county's fire department said on Twitter on Friday night. Authorities were forced to shut down the 101, a major north-south artery, as well as the Pacific Coast Highway. 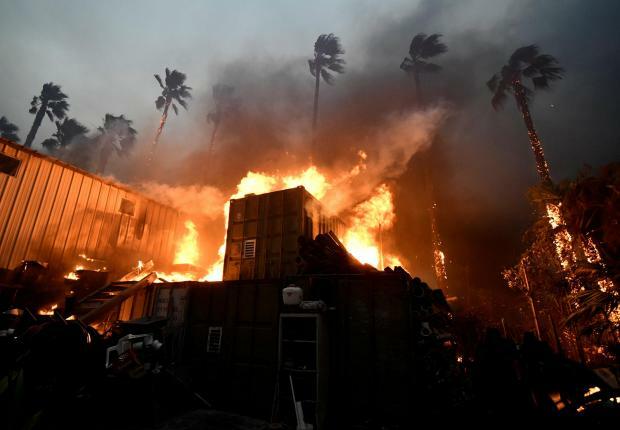 Los Angeles County Fire Chief Daryl Osby said a "significant number" of homes had been destroyed by the flames but that an accurate count could not yet be made. Elsewhere, the Hill Fire in Ventura County's Santa Rosa Valley had charred about 6,000 acres (2,428 hectares) as of Friday evening, according to Cal Fire.